Cleveland Carter with his prized 1956 John Deere Model 70 tractor, which started his hobby restoring John Deere equipment. Beware the power of grandchildren! Cleveland Carter was not searching for an all-consuming hobby when he attended the Calvary Mule Day Festival with his grandson a decade ago. But he certainly found one. The annual festival features old-timey farm attractions. And, of course, mules. Judges pick “the prettiest, ugliest, and most ornery” of that species. But it was another species that captured the attention of Carter’s grandson. Carter’s first restoration project was a 1956 model 70 John Deere tractor. Rather than sticking a toe in the water, Carter jumped straight into the deep end. The model 70 had been permanently parked beside a fence on a farm for about 20 years. It was badly rusted, and the engine wouldn’t start. 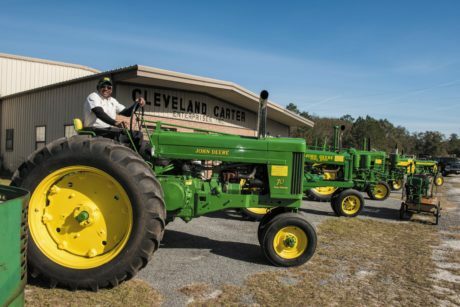 An acquaintance introduced Carter to Green, a magazine for John Deere tractor, equipment, and memorabilia enthusiasts, and that publication helped Carter get started. Carter’s background in construction didn’t hurt, either. He also turns to publications, tracking down a book with details about each tractor he purchases. Carter does all the mechanical restoration work, and he disassembles the machines and then sandblasts and primes all the pieces before turning them over to a neighbor for the final painting. But he’s learning how to do that, too. Carter relies on a 60-year-old tractor to plant corn he sells to local deer hunters. Now, not quite 10 years since starting his first restoration, Carter feels pretty comfortable with his process. “Oh, yeah, I got it now,” he said. “I figured it out.” But that first tractor was a test for him. 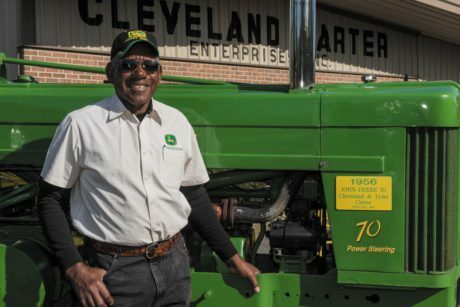 Cleveland Carter proudly stands among his robust tractor collection of John Deere equipment that has evolved over the years. Carter lives in Baxley, a small town about midway between Atlanta, Georgia, and Tallahassee, Florida. His father farmed, but though he died when Carter was young, Carter still remembers the equipment. He found one for sale in New Paris, Indiana. He purchased it, brought it back to Baxley, and restored it, adding a single-row corn planter with a fertilizer distributor. Carter uses it to plant about five acres of corn that he sells to local deer hunters. The tractor, a 430 S Standard, was also featured in an issue of Antique Power. 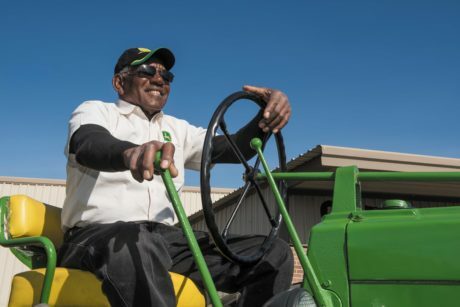 At at 72, Carter says he has no plans to stop restoring old John Deere equipment. For people concerned with farming in the U.S., all roads lead to the upper Midwest — the most productive region in the nation’s farm belt — which is why Carter found himself on the way to Iowa a few years ago. For each of the tractors in his collection, which now totals 16, he has purchased an appropriate John Deere implement. When a couple plows became available in Iowa, he turned the purchases into a road trip, the first to the Midwest for the life-long Georgia resident. Carter and his grandson did more than look at farms while in the Midwest. They camped along the Mississippi River and visited several Illinois-based John Deere facilities, taking tours of John Deere Harvester Works in East Moline and the John Deere Historical Site in Grand Detour, as well as strolling around the John Deere Pavilion and the Display Floor at Deere & Company World Headquarters in Moline. 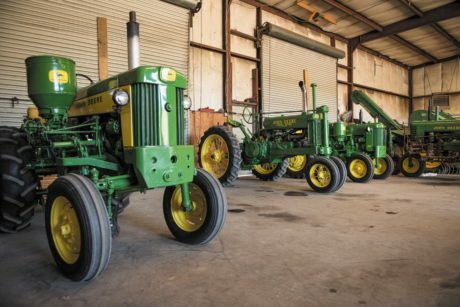 Restoring John Deere equipment is a family affair. Cleveland Carter with his grandson, Tyler Carter, and wife Georgia Carter in Baxley, Georgia. For Carter, restoring tractors isn’t the only attraction. The people are important, too. On their way back to Georgia, Carter and his grandson stopped in Kentucky to visit a fellow enthusiast who had sold Carter some parts. So good, Carter said, that if he needs a motor or some other part, his friend in Alabama will ship it. Even before asking how or when Carter will pay him. Although he’s 72 years old, Carter still sees plenty of restoring ahead. 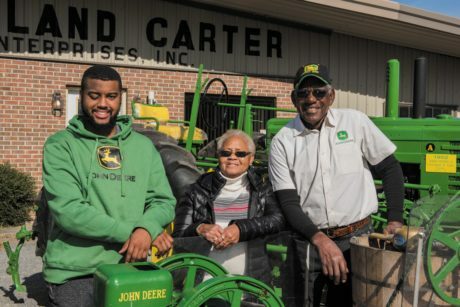 Carter stores his tractors and implements in a building on his property and one of his goals is to turn the building into a museum. He knows there’s already interest. You might also enjoy reading these related stories.